The Mercer County ESC Peace Chords Bell Choir took part in the 63rd annual Ohio School Boards annual conference on Monday, November 12th. The Mercer County ESC Peace Chords Bell Choir take part in the 63rd annual Ohio School Boards annual conference. The Mercer County ESC Peace Chords Bell Choir took part in the 63rd annual Ohio School Boards annual conference on Monday, November 12th. Six students, along with their director, Mrs Cathy Liening, shared information about their performances and the mission of the Peace Chords Bell Choir. 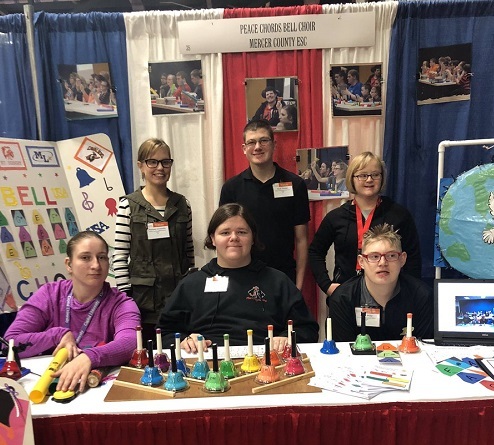 Students demonstrated the adaptive bells and helped conference attendees learn more about how this program could be replicated in their school district. The next performance of the Peace Chords Bell Choir is December 13th in Coldwater.